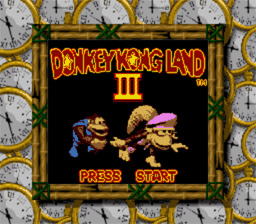 Play Donkey Kong Land 3 Now! A contest has started to find the Lost World, with big prizes involved! Donkey Kong and Diddy Kong (everyone knows them) have have taken off to find this Lost World. Dixie Kong, feeling that she had something to prove, teams with her baby cousin, Kiddy Kong. Little do any of them know that the evil King K. Rool and his crew of Kremlins are hot on the trail. If you loved the other DKL games, there's a very, very good chance you'll enjoy this one just as much. The game-play is quite similar to the other games, a side-scrolling adventure. The graphics are nice and big, detailed for a Gameboy game. There is some alright sound to the game, but not anywhere at the others' levels. So, if you like DK or any side-scrolling game for that matter, give this a go. The object of the game is simple; to get to the goal at the end of the level. During this, you'll come across several different creatures to fight. Some you'll just have to jump on them; others will need a different approach. Can you find that way? Play the card match game. Enter Up, Up, Down, Left, Right at the title screen. Enter Down, Down, Up, Left, Right at the title screen.